Israeli space agency partners with NASA to launch Israeli-made craft to the moon in the coming months. 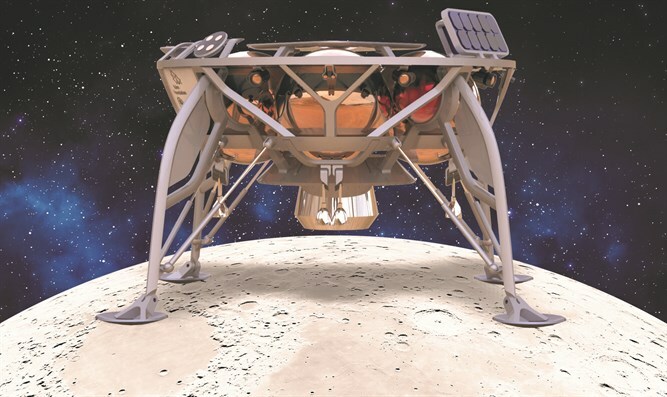 NASA and Israel's Space Agency have signed a new agreement to launch an Israeli spacecraft for the moon for the first time in the coming months. Arutz Sheva about the mission and cooperation with Avi Blassberger, director of the Israeli Space Agency at the Ministry of Science, who returned from the World Space Congress today and told us about the meetings held there. "The SpaceIL association decided to do a mission on the moon in a competition aimed at raising awareness of the space issue and motivating young people to study science by the Apollo effect," said Blassberger, referring to the process from the inception of the idea until "they now have a spacecraft ready for launch." On the cooperation with NASA, he said that this is reflected in the fact that "an instrument is installed on the spacecraft that enables its location and monitoring, which is good for them and for the organization. In addition, they will assist the association in communications services from the coast to Israel, which will help them greatly in carrying out the mission. " About the SpaceIL organization itself, he said that it is the one which is carrying out the work and building the spacecraft, in practice. On the connection between the association and the Ministry of Science, he said: "The Ministry of Science tries to help as best it can, and when signing international agreements, things are done through the Ministry of Science." "[Israel will be] the fourth country in the world to launch a spacecraft on the moon, but it is not an organization that is a space agency of a country," Blassberger said. The mission of the Israeli spacecraft is also to test a unique technology that was built in Israel in order to make it possible to reach the moon. The spacecraft will also be equipped with a scientific instrument that will enable the measurement of the magnetic field on the moon. "This is a very interesting subject for NASA and we will share it with the accumulated information." As stated above, Blassberger returned from Germany today where an annual international conference of senior space agencies in the world took place. "Israel is considered to be very advanced in the field of space, and recently we celebrated the 30th anniversary of the launch of the first Israeli satellite. Israel is one of the few that has all the capabilities in the field of space, design, construction, operation and launch of satellites. Israel has areas in which it is very advanced and leading countries treat us as equal partners, and countries that want to enter the field are happy to learn from us." "It is an annual conference of the World Association of Aeronautics and Astronautics, which is a meeting place for the updating of world developments, a meeting of policy makers, the signing of agreements, etc.," he said.